I just installed DP and I am not showing a lot of the tools you are. For instance, I cannot create the plane like you did because it is not docked on the right hand side of the screen. I turned every tool on looking for it, but cannot find it. I also cannot create a geometrical set. I am simply missing that option under "insert." Any idea why I am missing all these tools? Because many of the tools and menus are context sensitive, you may be in the wrong area to find the sketch tools. 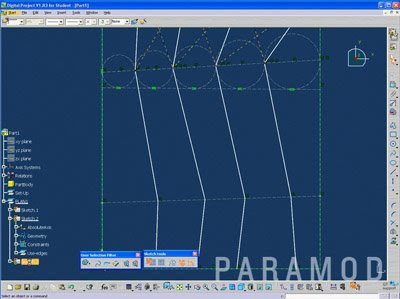 You will want to be in the geometry workbench, to do this click on 'start' in the top left corner, then select 'project center' and then select 'geometry'. This should change the menus and bring up the tools you are looking for. Let me know if this helps. Same problem. maybe i have to customize the toolbars? Same issue. I am missing workbenches only in the part workflow. If i'm working on a product everything is fine. Could this have something to do with the license being installed wrong? I'm not getting any support on this. You most likely have a viewing licence only(a case with the torrent files online). If you have a legitimate licence however email them and they will sort it out quite promptly.